Flashing Lights is a single player and multiplayer emergency services simulator focusing on police, emergency medical services and the fire department. Mostly Positive (155) - 72% of the 155 user reviews in the last 30 days are positive. Mixed (1,332) - 68% of the 1,332 user reviews for this game are positive. “The game is currently in Alpha and players may come across bugs. Various additional game features and mechanics are also in development and will be added throughout Early Access. 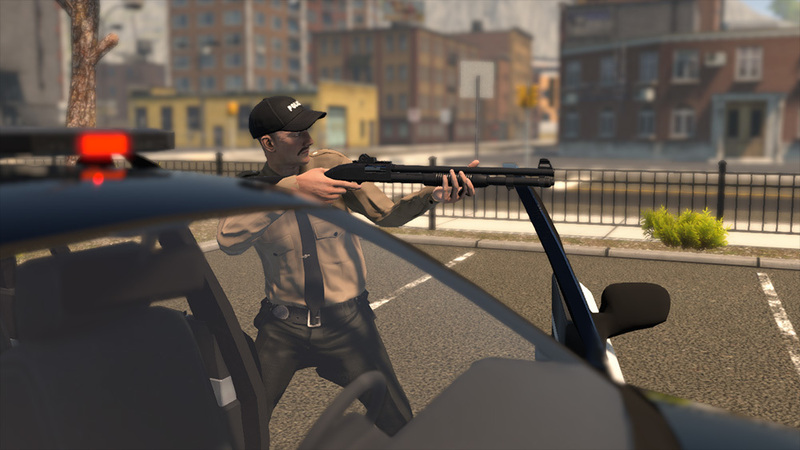 The role of police includes a mission in which players pursue a vehicle in an exciting car chase. They will also be able to pull over vehicles, ask them questions and issue an alcohol test. The speed gun, located in the boot, can be used to scan passing cars. The internal computer also has some functionality and is able to check the speed of the vehicle in front of you. Players can issue parking tickets to parked cars and will gain reputation based on positive and negative behaviour. The fire department have several callouts (missions) which require the player to put out building fires, container fires and rescue trapped civilians. They are able to operate the fire truck, use fire extinguishers, a fire hose and the jaws of life to complete a variety of missions. The EMS department has a couple of emergency missions to respond to which require the player to use the med bag to assess the injuries of a patient, and a stretcher that can be used to transport the patient back to the hospital. I am excited to announce Flashing Lights' Q2 2019 roadmap! We're excited to bring you all the much requested fire and EMS enhancements and additions in May and June. Thank you very much for all of your support so far, and we continue to listen closely to what you all want to see next! I'm excited to reveal that Flashing Lights' Gun Update is now available for everybody. We appreciate your patience, and we would love to hear what you all think of this new update! 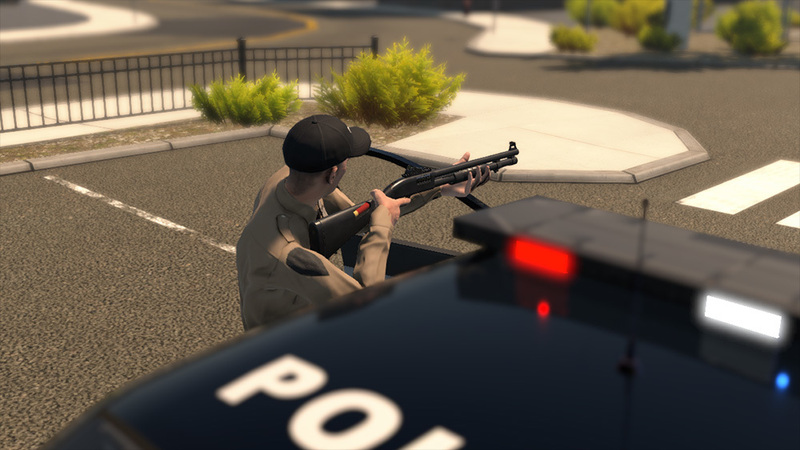 New to the police department are weapons and a number of new and updated callouts. As well as the new handgun and shotgun, developer Nils Jakrins has also added a variety of building interiors for you to explore in the game’s open world. The entirety of Flashing Lights, including today’s new content, is available in either single player or up to ten player multiplayer. Flashing Lights is also on a 25% off sale for the next ten days - this is the largest discount we've ever done on Steam, so make sure to jump in! Watch out for news coming soon on what's next for Flashing Lights! Usually the first to respond to a criminal incident, the police are equipped with the fastest vehicle and a variety of equipment. Their roles vary from handing out parking tickets to chasing down dangerous suspects. They’ll do everything they can to prevent criminal activity and put a stop to any crimes in progress. As an emergency medical specialist, your job lies in keeping members of the public alive, treating patients’ injuries, diagnosis and more. Lifesaving equipment you’ll utilise includes medical kits, stretchers and ambulances. The role of the fire department extends far beyond putting out flames, as they work closely with medical services out in the field, swiftly cutting open crashed cars so that medical staff can reach the casualty. The fire department won’t engage in the pursuit of suspects, but will handle the aftermath of an incident, including, of course, putting out fires. Battling raging flames and freeing trapped civilians involves some heavy-duty gear including spreaders, a fire hose, a fire extinguisher and a fire truck.